The hop turn has become somewhat of a lost art in the new age of skiing. Blame it on the popularity of aerial maneuvers or the evolution in ski design, but the hop turn has been thrown overboard like Captain Jack Sparrow dumping barrels of rum off the Black Pearl to sail his ship faster. But what’s a pirate ship without rum, and what is skiing without the hop turn? It’s not only stylish and fun, but it is a useful tool in steep or tight terrain. When executed properly you soar through the sky feeling like ski legends Scot Schmidt and Doug Coombs. If executed poorly, be sure to tag @jerryoftheday. There are a lot of moving parts in a proper hop turn, and it can feel like your body parts are flying in different directions at the same time. Fear not! The turn has a mind of its own, and the most important part is just to go along for the ride and enjoy the flight. One of the most common mistakes when people try a hop turn for the first time is actually using their legs to “hop” from one turn to the next. But jumping is hard, and not a very efficient use of energy. Instead, let the skis work for you, not against you. Think about using your skis as a spring to shoot into the sky like a Katy Perry firework. No two turns are the same, so have fun adding some personal expression and flare. Practice won’t make perfect because there isn’t such a thing as the perfect turn, so don’t be so hard on yourself and keep trying. The hop turn takes a certain level of ski mastery to execute. And when someone says, “you looked a lot like Scot Schmidt!” that’s the best compliment you can get. This is where the energy for the hop turn starts. Pressure the downhill ski into the fall line through the heel. Anticipate the pole plant by reaching down the hill parallel to your leg. After 10 years of coaching freeride and race camps, Caston has developed a coaching philosophy based on building a solid foundation of fundamentals, yet leaving room for personal expression. Check out partybeachskicamps.com for more. SKI Magazine teamed up with the Professional Ski Instructors of America (PSIA) to design the online course How to Break Through. 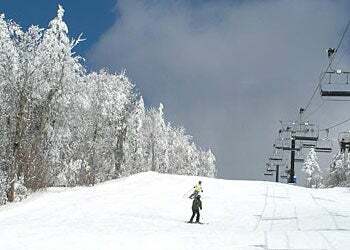 This course is for intermediate and advanced skiers ready to kick their skiing up a notch on all types of terrain. Shot on location at Valle Nevado, Chile. Less than 40 miles from downtown Santiago, Valle Nevado offers a number of great ski-and-stay packages, heli skiing, and Mountain Collective passholder benefits. International beer list, excellent food and a ski-in/ski-out atmosphere make the Hop Garden in Telluride a diverse on-mountain option.